Despite the fact than many snakes engage in the behavior, boa constrictors (Boa constrictor ssp.) derive their name from the constricting behavior that they use to subdue and kill their prey. Nevertheless, because of their size, boa constrictors are one of the strongest constricting snakes. While advanced snakes (family Colubridae) exhibit a number of methods for coiling around prey, all primitive snakes (families Acrochordidae, Aniliidae, Boidae, and Xenopeltidae), including boas, apply coils in the same manner. First, the snake strikes its intended prey. Upon contact, the snake’s momentum carries it forward, rolling over the prey. In an instant, the snake has struck its prey and applied several constricting coils. If the snake does not apply the coils quickly and effectively, the prey can escape or injure the snake. The constricting coils kill the prey by cardiac arrest, asphyxiation or, in the case of very large snakes, spinal fracture. Squeezing their coils requires significant energy; snakes benefit by stopping as soon as the prey is dead. Publishing their results in “Biology Letters,” Scott M. Boback et al., investigated the stimuli that signal boa constrictors to stop squeezing their prey. The 2012 study demonstrated that boas have the ability to feel their prey’s heartbeat; when the prey’s heartbeat stops, the snake releases its coils gradually. One of the few studies of constriction pressure, led by Brad R. Moon and Rita S. Mehta who published their results in the 2007 book, “Biology of Boas and Pythons,” tested the constricting pressure of several species, including boa constrictors. The highest constricting pressure recorded by the team, 25 pounds per square inch, was generated by a boa constrictor that was about 7 feet in total length. The primary variable in constriction pressure is the thickness of the snake; doubling the diameter of a snake increases its constriction pressure by a factor of 2.6. While boas can suffocate their prey, cardiac arrest kills prey more quickly. If they apply their coils effectively, adult boa constrictors generate much more force than is necessary to offset their prey’s blood pressure and cause circulatory failure. Most mammalian blood pressures only measure two to six pounds per square inch. While boa constrictors typically consume rodents and birds, scientists have documented boas consuming large animals, like monkeys, wild pigs and tree porcupines. Contrary to the common misconception, boa constrictors do not automatically constrict people who handle them. Boas usually only constrict their prey, but in extreme cases, they may attempt to constrict predators as well. 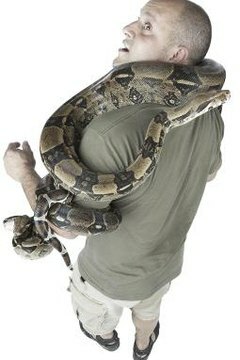 Boas often grip their handlers to prevent falling, and many people misinterpret this as constricting behavior. Common sense safety is appropriate: never handle a large snake by yourself, make sure you do not smell like food and do not allow a snake to encircle your neck. If a snake constricts part of your body, an alcohol-soaked cotton swab placed in front of the snake’s nostrils often will cause them to release their grip, as will submersion in hot or cold water. When attempting to unwrap a constricting snake, work from the tail towards the head. Can Cobras Hypnotize Their Prey? What Are the Gaboon Viper's Enemies?